Yesterday was the first day in business for Breadbelly, the new Asian-American bakery and cafe open at 1408 Clement St. 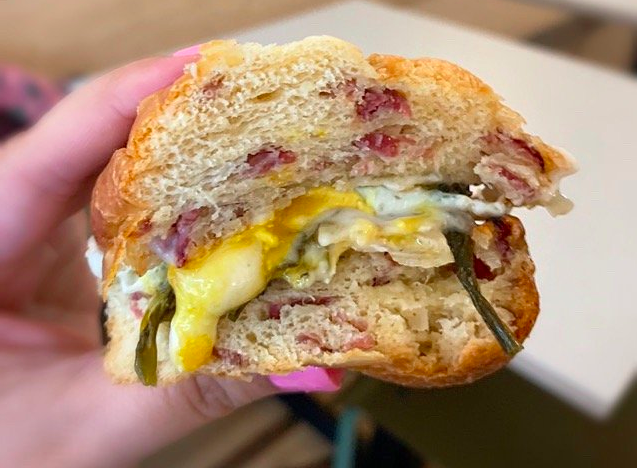 Formerly the site of Heartbaker, Sybil Johnson's enterprise that closed a year ago after four and a half years in business, Breadbelly is a joint operation between Katherine Campecino, Clement Hsu, and James Wong. "We're chefs who've cooked around in the city," Hsu told Hoodline in a brief break from the opening-day activity. 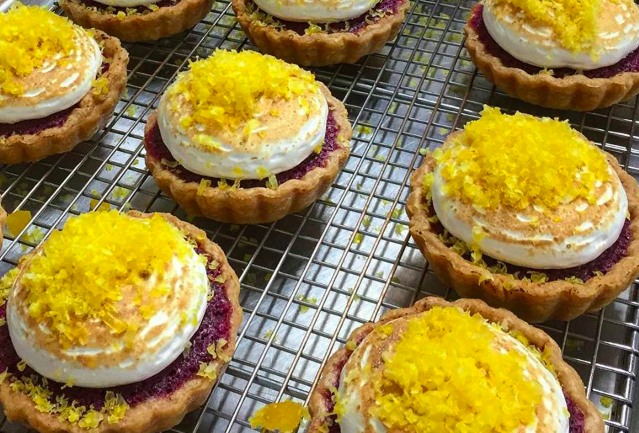 Breadbelly's brick-and-mortar comes after the group honed its offering with box deliveries, bake sales, and pop-ups at Andytown Roastery. Outfitting the space -- from the logo to the custom banquettes, seating, and tile work -- was a labor of love, with all the work done by the new owners and their families, said a friend of the owners who was on hand to help out. After a soft opening last weekend, the bakery's full offerings, including beer and wine, are now available. The menu sports a mix of sweets and savory items, with treats ranging from an anko sticky bun ($5.50) to the kaya toast with milk bread and coconut-pandan jam ($5.50) to the "not ube!" tart made with creamy purple sweet potato ($7). Savories include a roasted pork char siu sandwich with cucumbers and bok choi ($16), and gyeran bang, a dish with sweet cornbread and Korean chili ($7). The drinks menu includes Wrecking Ball coffee, chrysanthemum and oolong teas, and sesame horchata with rice milk, along with wine and beer, including Iwate Kura Sansho ale. Breadbelly is open Monday, Thursday, and Friday from 7 a.m. to 4 p.m., and Saturday and Sunday from 8 a.m. - 4 p.m.